There’s a fun little web game on Yahoo! Games called Notebook Wars 2. I saw an ad for it yesterday on their site and decided to give it a go. 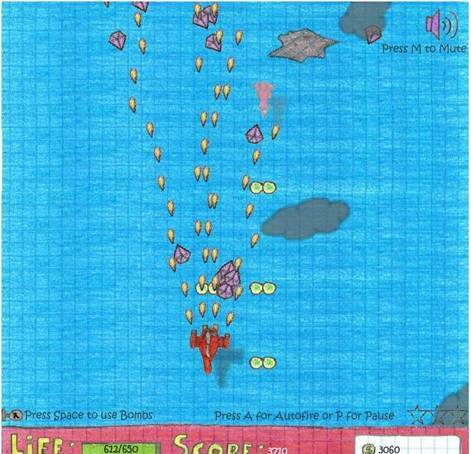 It’s similar to those classic overhead vertical scrolling games like 1942. In other words, it’s cool! 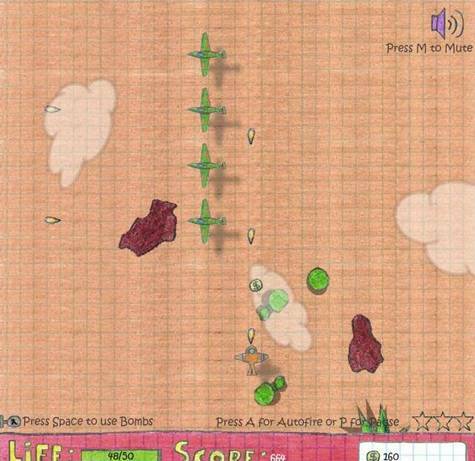 You shoot down the bad guys and earn money. That money can buy you better versions of your current weapons, or better weapons altogether. You can also upgrade your plane. You start off with a plane with one weapon slot, but can eventually earn enough to buy a plane with four weapon slots. You then have to pay extra to equip each slot (a one-time fee per slot). It’s easy enough to figure out, and you can replay the same level to keep earning money before moving on. There are also unlimited lives, and you don’t have to download anything. It should take you a couple of hours max to beat the entire game. I wish the later levels were a little harder, but all in all it’s a nice little time waster.